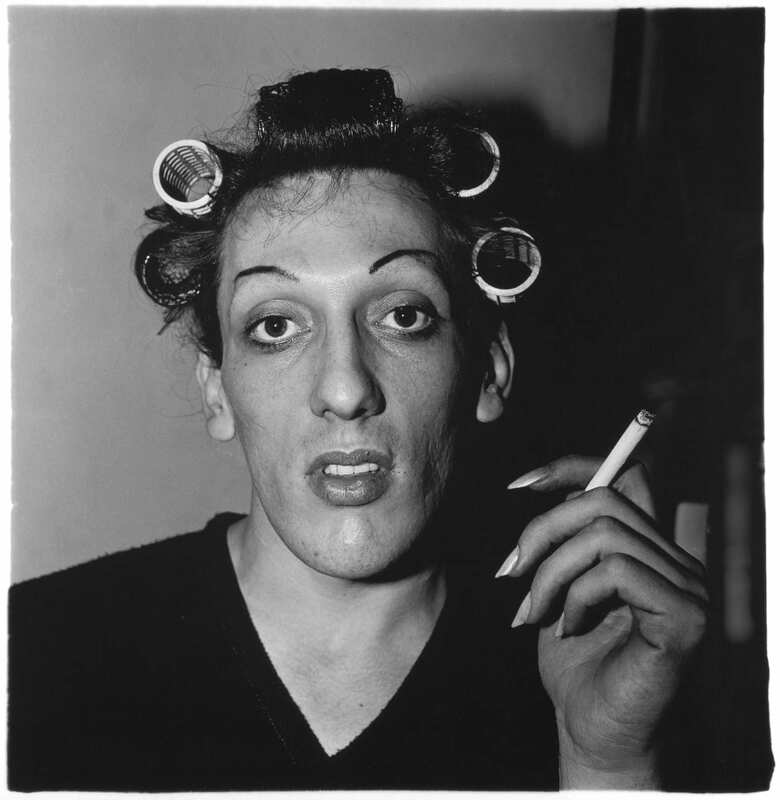 Arbus uses a strong flash to create a high-contrast photograph in “A Young Man in Curlers at Home on West 20th Street,” which is representative of the strong, conflicting ideologies of Americans in the 1960s. The man’s face is stark white compared to his surroundings, exemplifying his exclusion from mainstream society as a transvestite. Much has been written about Diane Arbus’s fascination by those considered “freaks” or citizens on the fringe of society. However, when these portraits are put into the context of the era in which she photographed them, the less they appear to be sheer fascination of the obscure, but rather, a response to the turbulent decade of the 60s. This decade was wrought with several minority groups (Blacks, Hispanics, Native Americans, Jews and women) rising to the surface; exclaiming their rights to be heard and refusal to be brushed aside. The civil rights movement began peacefully with Martin Luther King, but eventually gave way to more violent action by the Black Power movement. (7) Growing dissent over the Vietnam War also moved from peaceful sit-ins and protest music to guerilla tactics taken by groups such as the Weather Underground. From San Francisco’s Haight Asbury to the streets of New York, the 60s brought about vast change that ripped down barriers and created a country often divided on not only the war, but also controversial issues such as abortion, mystic religion, drug use and even organ transplants. 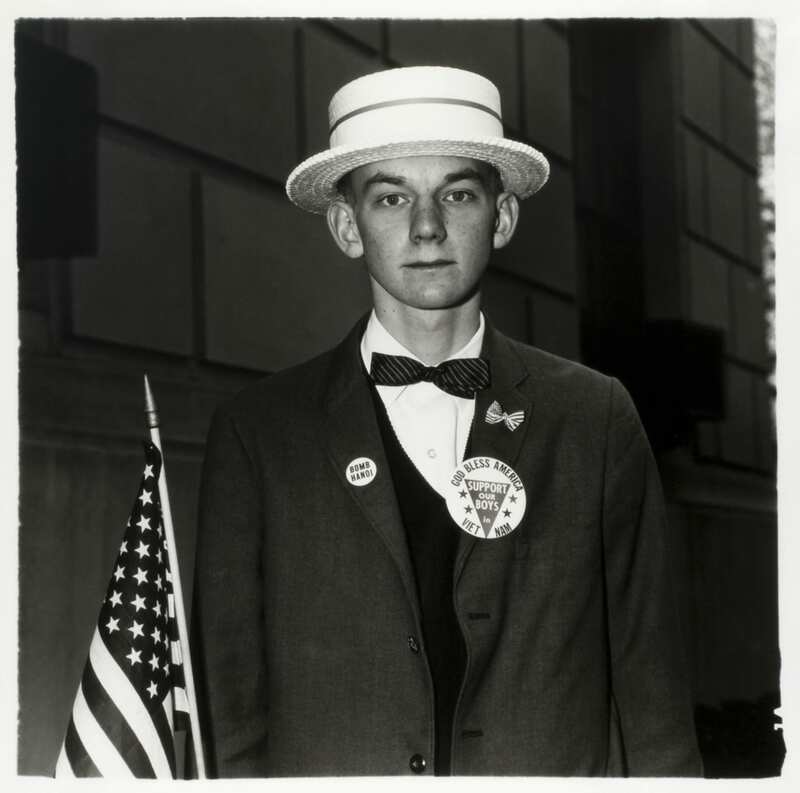 Two of Diane Arbus’s portraits in particular, “A Boy with a Straw Hat Waiting to March in a Pro-War Parade” (N.Y.C. 1967) and “A Young Man in Curlers at Home on West 20th Street” (N.Y.C. 1966) provide a visual representation of 1960s American tensions concerning such issues as the Vietnam War (Conflict), and the growing counterculture. Although the subjects photographed for each portrait are vastly different, her use of various lighting and compositional devices, and her natural ability to capture the true nature of her subjects, allow both pictures to represent two sides of the same coin. Viewers are forced into this confrontation in both photos. Both sets of eyes look directly at the viewer, creating an uncomfortable moment of peering into their loneliness and fear due to their lifestyle choices. This is especially prominent in “A Boy with a Straw Hat…” One sees that although the boy proudly displays a flag in one hand and his pro-Vietnam sentiments on his chest through buttons that proclaim, “BOMB HANOI” and “God Bless America, Support Our Boys in Vietnam,” his eyes tell a different story of uncertainty. This is because in the same year the photo was taken, “certain groups were marching under Vietcong banners and that Vietcong banners flanked the speakers’ stand, while Americans were fighting against and being killed by Vietcong.” (13) It is also of note that Arbus’s own feelings against the war helped create this moment. One year after this photograph was taken, “…Diane demonstrated against the war. She, who had never voiced a political opinion, wrapped a white band about her head and joined a huge crowd, also in white headbands, who were marching silently across Manhattan to protest the escalation of bombing.” (3) Along with her choice to tightly frame her subject, she also chose to use a different film format to allow her photographs to stand out. In the 1960s Arbus used a square format to place her subjects into a unified space, instead of the 35mm format she used in the 1950s. “In 1962, apparently searching for greater clarity and for a more direct relationship with the individuals she was photographing-she turned away from the 35-mm camera favored by most of the documentary photographers of her era. She started working with a square format (21/4-inch twin-lens reflex) camera and began making portraits marked by a formal classical style…” (6) She chose to place her subjects either dead center in this square as in “The Boy With a Straw Hat,” or just slightly off as in “A Young Man in Curlers…” By doing so, “…her preferred square format provided a neutral frame for the central revelation of the human subject itself.” (11) This leads to the other method Arbus used to expose the human condition of those living in the 60s-exposing specific details. In both portraits, Arbus uses highlights and shadows to emphasize the details of each individual, creating images that unite the human condition. By focusing on the details, the viewer is able to find a connection to each subject, reinforcing the need for unity during a turbulent era. These details normalize “A Young Man in Curlers…” so that the viewer finds a piece of him or herself within a person they normally could not relate to. This reflects the 60s mantra that we are all “brothers and sisters,” and until this is realized, change would be impossible. It also celebrates the postmodern belief in the uniqueness of each individual being relevant. “Her refusal to patronize her subjects is in fact a tribute to the singularity of each and every one of us and constitutes a deep and abiding humanism. The result is a body of work that penetrates the psyche with all the force of a personal encounter and, in so doing, broadens our understanding of ourselves and those around us.” (6) Arbus dove deeper into these details as she became interested in not just the subjects’ features, but also how certain surfaces came across in her photos. Arbus became more aware of the density of different materials in her photographs during this time. Although she said she wasn’t interested in texture, (“It really bores the hell out of me.” (2) Clarity was important to her in these photographs. “I wanted to see the difference between flesh and material, the densities of different kinds of things: air and water and shiny.” (2) This is displayed in the heaviness of the dark circles under “A Young Man in Curlers…” eyes and the spotty texture of “A Boy in a Straw Hat’s” freckled face that displays his youth despite his expression and cause. Kozloff writes: “Arbus presents glittering tinsel and social anomie with corrosive exhilaration, and the very sweat and pores of several models are textured as if they are the news.” (9) These details were not found by accident-Arbus was careful when deciding how and what she photographed. Arbus had the gift of intuition when choosing subjects to photograph. In both portraits, she captures the personality behind the exterior. This was especially pertinent in the 1960s, as movements rose up to demand the truth from the American government. “To Arbus, and to an American audience in the late 1960s and 1970s that had seen the emergence of a counterculture that had radically questioned what was true and of value, the outcast from society seemed to embody a kind of heroic status, an emblematic sainthood.” (11) Although Arbus sometimes spent days with her subjects developing what she sometimes believed to be a fraudulent bond-“I’m extremely likeable with them. I think I’m kind of two faced. I’m very ingratiating. It really kind of annoys me. I’m just sort of a little too nice.” (2)-she also was able to snap quick shots that encapsulated her subjects’ personality. Vince Aletti writes: “Although it’s clear from the contact sheets included in the book and the show that many of her photographs were taken quickly, Arbus was never comfortable being a hit-and-run street photographer…Arbus clearly disarmed her subjects and drew them into a relationship that, no mater how brief, flared into moments of remarkable warmth on camera.” (1) It is this ability that resonated with viewers both during the 60s and present day alike. “The slogan, “make love, not war” may have done little to end the Vietnam conflict, but it did symbolize a markedly altered style for doing selfhood as well as a markedly different view of appropriate behavior.” (7) Diane Arbus’s photographs also capture this sentiment that originates from the tumultuous times of the 60s. Her work continues to fascinate viewers to this day due to the fact that Americans, although seemingly more tolerant, are more divided than ever. Controversy over the Iraq War is similar to Vietnam; gay marriage is an extension of the gay rights movement; affirmative action debates continue to rage; and even women’s rights over abortion are being questioned. From portraits taken of wounded soldiers to wedded gay couples, Arbus’s contribution to photography will remain relevant for decades to come. 4. Coleman, Allan D. Light Readings. New York: Oxford UP, 1979. Abbs. Philadelphia: The Falmer P, Taylor & Francis, 1989. 6. “Diane Arbus’ Revelations on Life.” USA Today Magazine Jan. 2004. Wilson Plus Select. 20 Nov. 2005. 7. Garrett, William R. “Cultural Revolution and Character Formation. (the 1960s).” World and I 13 (1998). 8. Hoffman, Katherine. Concepts of Identity: Historical and Contemporary Images and Portratis of Self and Family. New York: HarperCollins, Inc., 1996. 9. Kozloff, Max. “The Uncanny Portrait.” The Camera Viewed: Writings on Twentieth-Century Photography. Ed. Peninah R. Petruck. New York: E.P. Dutton, 1979. 103-117. 10. O’Brien, Barbara. “Learning to Read: The Eic Narratives of Diane Arbus and August Sander.” Art New England. Oct./Nov. (2004): 22-23. City.Baltimore: Johns Hopkins UP, 1999. Posted in Essays, Masters and tagged 1960s, Archive Highlights, Diane Arbus, Laurie Maisano, New York City, Photography, Portrait.